Off campus boys hostel accommodating 200 students has been provided complete with beads, tables, cupboards etc. In addition separate hostel for more than 30 girls have been arranged in good area of Ghaziabad. Each hostel has adequate, safely Security Telephone connection, recreational facilities like T.V., Newspapers/Magazines, Tables Tennis etc. The Institute bus commutes the hosteller and from the Institute. Construction of an additional hostel for boys and girls is in advanced stage of planning. The Institute has a cafeteria within the campus, which provides varieties of fast food, snacks, beverages as well as lunch facility at rates controlled by institute. The quality of the food is checked on regular basis by the authorities concerned. 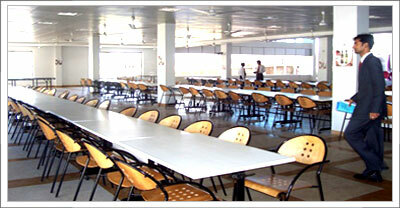 Cafeteria has a sufficient sitting capacity.